"The 2nd Annual Waimea PrepareAthon is scheduled for Saturday, Aug. 25, 2018, from 9 a.m. to noon at Mana Christian Ohana. This emergency preparedness fair that is part of the FEMA PrepareAthon program. This is a free, fun, family community event. No alcohol and no smoking. Emergency preparation is the focus and we have government agencies, companies and individuals who are passionate about preparing for disasters, and helping to make households and individuals more prepared to handle the unexpected. "The WCDRT in partnership with the Waiʻanae Coast Rotary Club (WCRC) and the Waiʻanae Military Civilian Advisory Council (WMCAC) are hosting the 3rd Annual Waiʻanae Coast Emergency Preparedness Fair on Saturday, June 2, 2018, from 9:00 a.m. to 1:00 p.m. in the inner breezeway of Waiʻanae Mall (86-120 Farrington Highway Waiʻanae, Hawaiʻi 96792). Come peruse the dozens of booths hosted by local, state, federal, private, and business organizations. They will be sharing information, resources, interactive activities, and giveaways relating to general safety and emergency preparedness. We will also have a number of static vehicle displays, demonstrations, and entertainment. Hope to see you on June 2nd!" Swing by HWMO's outreach booth for the latest wildfire preparedness information and youth activities. Our friends from Waikoloa Dry Forest Initiative are inviting everyone, yet again, to their exciting, family-friendly event on February 10, 2018: the 7th Annual Wiliwili Festival. "We are looking forward to our biggest community event of the year and beginning to plan the details! The Wiliwili Festival is a free, family-friendly event that celebrates our beloved wiliwili trees and the lowland dry forest of our islands. We will be inviting speakers, practitioners, nonprofits, vendors, conservation groups, and the public to join us for a day of educational activities, forest tours, workshops, live music and great food! We'll be sending out invitations and more information soon! If you'd like to become a business sponsor, donate to our silent auction or apply to host a booth, please contact us." More info to come, but for now, Save the Date! Come say hi to us at this year's Agriculture & Environmental Awareness Day at the Pearl City Urban Garden Center on Oahu. We will have information on how to prepare for wildfires, whether you are a resident, farmer, rancher, large landowner...the list goes on. "The purpose of Agriculture & Environmental Awareness Day is to create a greater awareness and understanding of agriculture and the environment among students and teachers, and introduce students to career opportunities in agriculture and environmental studies." If you are on Oahu, you should definitely go check out this event and join our friends from Livable Hawaii Kai Hui, partners of ours who are helping establish Oahu's first Firewise Community in Kamilonui-Mariner's Cove. 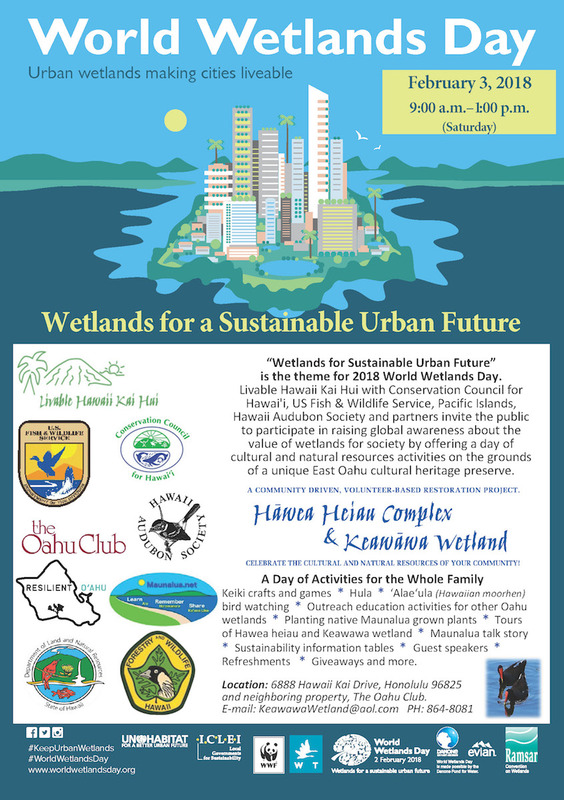 "We at Livable Hawaii Kai Hui are simply overjoyed to invite you to the Aloha State's official World Wetlands Day event. 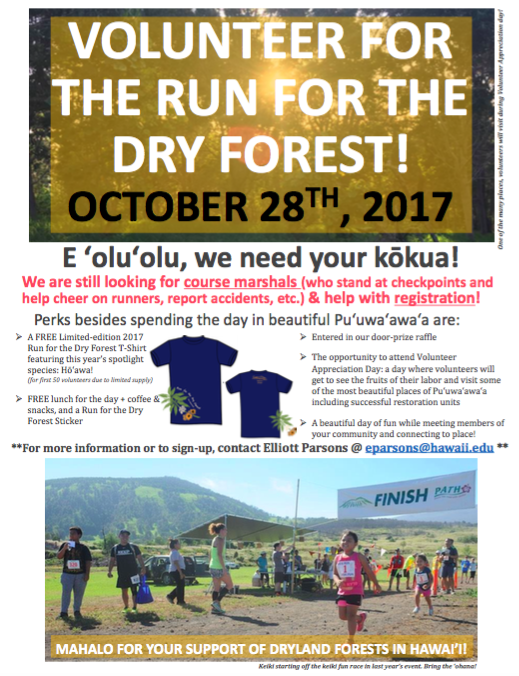 On Feb. 3, 2018, we will be hosting WWD 2018 at the Hāwea Heiau Complex & Keawāwa Wetland. It will be a day full of fun and learning, including keiki crafts, talk-story sessions, hula, information booths, bird watching, and plantings of native flora grown right here in Maunalua. This year's theme, set by the Ramsar Convention on Wetlands, is "Wetlands for a Sustainable Urban Future." We can't think of a better place than Maunalua, our developed Hawaii Kai suburb, to host WWD 2018. Tomorrow's needs can only be met if we acknowledge our dependence on the natural world today, and mālama the natural and cultural resources we still have access to. Please be sure to join us, and share this message with your friends and family. Our activity-filled day will kickoff with a loulu palm planting and dedication ceremony in honor of the late Ron Walker (1932-2012). Ron was an extremely hard working wildlife biologist/wetland ecologist who dedicated decades of his life to the protection and enhancement of Hawaiian ecosystems. Special thanks to all our participating organizations, and in particular, our partners who are helping to organize and sponsor this event: Conservation Council for Hawaiʻi; US Fish & Wildlife Service, Pacific Islands; Hawaii Audubon Society; The Oahu Club; Maunalua.net; DLNR Division of Forestry and Wildlife; Honolulu Office of Climate Change, Sustainability and Resiliency." "This annually held fair is free and open to the public so bring your friends and family. This year's theme is Prepare Today...Survive Tomorrow and attendees will be given an opportunity to learn more about what is needed in an emergency preparedness kit and preview emergency response training. The event is also attended by roughly 50 organizations, businesses and first responders who host their own booths and provide community residents with tools, information, and the chance to experience training first hand to help them better prepare their families for an emergency. In addition, there will also be entertainment, food booths, and free giveaways." 2016 Ewa Beach Emergency Preparedness Fair from the HWMO booth. The event is organized by the Ewa Emergency Preparedness Committee (Ewa EPC). "The Ewa Emergency Preparedness Committee (Ewa EPC) is made up of local volunteers donating their time to work with the community to better prepare for an 'All Hazard Event' (i.e. natural disasters such as hurricanes or man-made disasters such as terrorist attacks). Their mission is to establish procedures for the community of Ewa Beach that are designed to organize, assist, educate, support, and train residents on how to prepare for, respond to, and assist in the recovery of an 'All Hazards Event.'" "A new fungal disease is currently attacking and killing ʻōhiʻa (Metrosideros polymorpha), the most abundant native tree in the state of Hawaiʻi. On Hawaiʻi Island, hundreds of thousands of ʻōhiʻa have already died across thousands of acres from this fungus, called Ceratocystis fimbriata. Healthy trees appear to die within a few days to a few weeks, which is how the disease came to be called “Rapid ʻŌhiʻa Death.” This disease has killed trees in the South Hilo, Puna, Kaʻū and Kona districts of Hawaiʻi Island and has the potential to kill ʻōhiʻa trees statewide." Join University of Hawaiʻi College of Tropical Agriculture and Human Resources in celebrating ʻōhiʻa at ʻŌhiʻa Love Fest! This family friendly event will be held on Sunday, August 27, 2017 at ʻImiloa Astronomy Center in Hilo, Hawaiʻi from 9AM to 4PM." HWMO will be selling tickets to the Firefighter Chili Cook-Off at this year's rodeo! "Waimea, Island of Hawai‘i ~ Parker Ranch will celebrate its paniolo (Hawaiian cowboy) heritage at the 55th Annual Fourth of July Rodeo and Horse Races on Tuesday, July 4, 2017 at the Parker Ranch Rodeo Arena in Waimea. While celebrating our nation’s independence, Parker Ranch paniolo, will be joined by other nearby ranches for a round-up of traditional rodeo events, including horse races, ranch mugging, team roping and more. These events will showcase the skills that have made Hawaiian paniolo famous throughout the world and which continue to keep the unique ranching lifestyle and culture alive in Hawai’i. Gates open at 7:00 am and you can enjoy a variety of crafts and food from local businesses. There will also be activities for the kids, such as a petting zoo and pony rides. " "Tickets for the July 4th event are available in advance for $7 or $10 at the gate. Children 12 and under are free. For more information, call 808-885-7311 or visit www.parkerranch.com. The rodeo grounds are 37 miles by car from Kona International Airport and 57 miles from Hilo Airport on Highway 190." Check out this exciting event that we will be hosting an information booth at on June 17! "The east side of Hawaii Island, Puna district, has been the area hardest hit by Rapid ʻŌhiʻa Death (ROD), a disease caused by a fungus new to science. ROD is killing ʻōhiʻa on the Big Island, where thousands of trees have died and more than 50,000 acres have been affected. Our native ʻōhiʻa forests are a beloved cultural and natural resource, and are the source of our fresh water. The devastating ROD disease will have impacts ranging from the land to the sea. To help raise awareness about ROD, the Grassroots Community Development Group, Bodacious Women of Pāhoa, Nanawale Community Association, the University of Hawaii Cooperative Extension Service, and Hawaii State Division of Forestry & Wildlife are collaborating to host Forest Roots, a joint family education day and hunting tournament in the heart of Puna. On Saturday, June 17, 2017, Forest Roots will invite Big Island residents to learn about forest and ocean health and the threat of ROD through fun activities for all ages. There will be a hunting tournament, casting contest, forest and ocean educational activities, demonstrations, and informational booths. Forest Roots will provide an invaluable educational and networking opportunity for all contributors and participants. We hope to convey the seriousness of ROD and share how Big Island residents can all help to spread awareness with each other and prevent the spread of this terrible disease within their communities." We will be one of many informational booths at this year's Waiʻanae Coast Disaster Awareness and Readiness Fair at the Waiʻanae Mall on Saturday, June 3 (9:00 a.m. - 1 p.m.). Come visit our booth for the latest information on how to prepare your home, family, and community for wildfire. Peak fire season is here, so it could not be a better time to be vigilant and ready! Thank you to Waiʻanae Coast Disaster Readiness Team for putting on the event and inviting us to join! 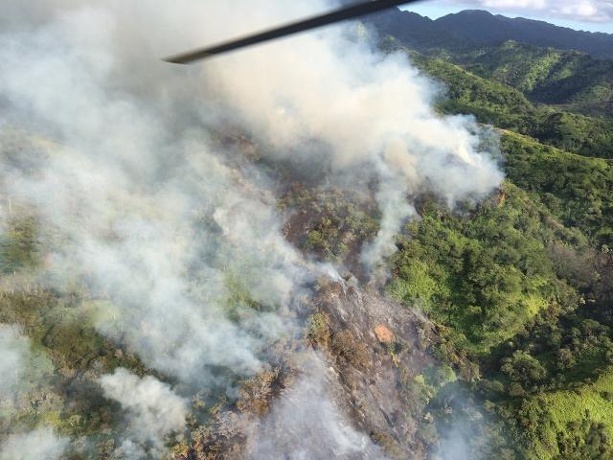 HWMO will have an educational booth at the People's Climate Movement in Kailua-Kona on Saturday, April 29 with information on wildfire impacts and how to prepare. We will be featuring our new infographic flyer on the impacts of climate change on wildfires in Hawaii. "Climate change is upon us, it is our global kuleana to be loving stewards. "We do not inherit the earth from our ancestors; we borrow it from our children". We will gather at Hale Halawai Park at 2pm and embark on a march loop through downtown Kona ending back at Hale Halawai at 3pm for a rally featuring music, inspirational speakers, food, entertainment, action booths from local non-profits, and consciously minded vendors. Please check out our auspicious list of presenters and performers on our event poster in the discussion tab to get a taste of what's in store." Waimea Outdoor Circle is hosting a spring plant sale at the beautiful Ulu Laʻau Waimea Nature Park on April 8 from 9 a.m. to 1 p.m. HWMO will be there with an informational booth and activities for the kids. Great opportunity to pick up some native Firewise plants for you or a friend's garden! Parking is available behind Canada-France on Ahuli Circle. HWMO is headed to Oahu for the Agriculture and Environmental Awareness Day for Family and Friends fair hosted by UH College of Tropical and Human Resources. Come stop by our booth for wildfire preparedness information and activities for keiki. Come visit HWMO's booth to get the latest Kaleo the Pueo giveaways and learn about wildfire preparedness, native Firewise plants, and more! Ewa Beach Emergency Preparedness Committee (EWA EPC) is hosting its 6th annual "Get Ready Ewa Beach Emergency Preparedness Fair" at Ewa Makai Middle School on Saturday, September 10th (9:00 a.m. - 1 p.m.) Make sure to stop by HWMO's booth! We will be setting up an information booth at the new campus' Open House. With El Niño's drought looking more and more like a possibility, there's no better time than now to prepare. Stop by for more information on the drought and how you can prevent and prepare for wildfires. At this year's Kohala Mountain Pumpkin Patch Festival, HWMO will have an outreach booth on October 24th with fan favorites including: Keiki Wildland Photo Shoot, native Firewise plant showcase, fire triangle games, and more! Come visit K-Mart in Kailua-Kona to learn from a variety of groups about safety, including Department of health, Hawaii Fire Department, Hawaii Police Department, and Hawaii Wildfire Management Organization. Save the date for this yearʻs Wiliwili Festival. HWMO will be there with a booth with great informational handouts, Kaleo the Pueo giveaways, a Keiki Wildland Firefighter Photo-Shoot, native plant games, and more! Also stay tuned for updates on when we'll be holding a Ready, Set, Go! Workshop at the event. Come get to know some of Hawaii's native Firewise plants. Seems like it was only yesterday when the beginning of graduation season was upon us. We'll be posting up at this year's Back-to-School Bash at Waikoloa Middle School with plenty of Kaleo the Pueo and Smokey the Bear giveaways, Keiki Wildland Firefighter Photo-Shoot, and native Firewise plant showcases.